On September 12th, the 9th Grade Academy embarked on a journey to experience LEAD and team building exercises and thrilling adventures at Camp Guyasuta, an annual field trip. Students split into smaller groups to learn how to communicate better with their peers. They did activities such as trust falls, guiding each other across obstacles, and high ropes courses. Almost everyone enjoyed the events at Camp Guyasuta. Madame Hart’s group is learning communication skills within their group on the low ropes course. 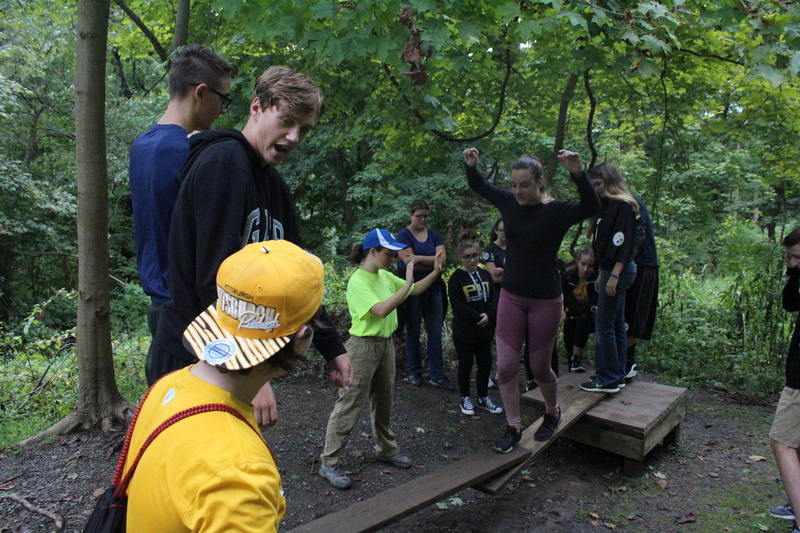 Mr. Haskins’ group is working on a low ropes course activity by walking across a bridge to avoid ‘lava’. 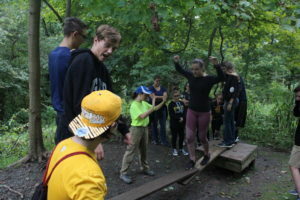 Accounting for the beginning of the trip, there were many trust building activities that consisted throughout the low ropes course. 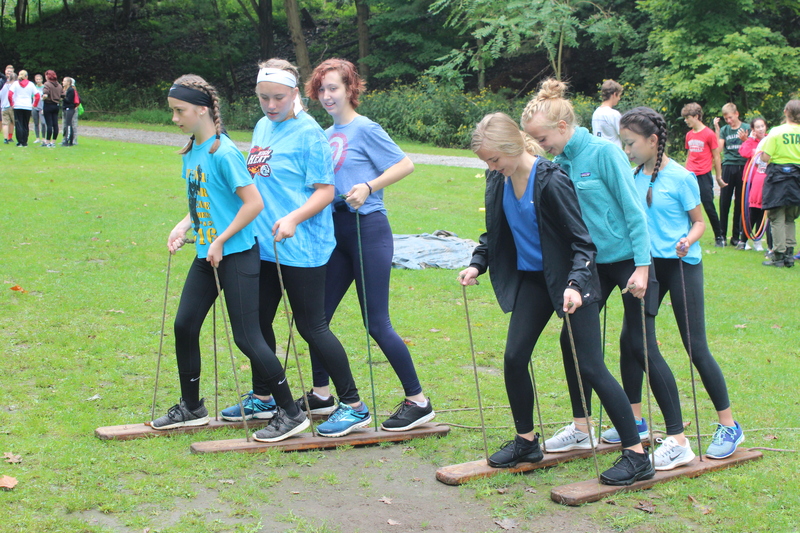 Multiple versions of trying to balance your whole team onto a wooden platform, getting through ropes and tires without touching said items, having numerous setbacks, and walking along tightropes without a guide alongside were the main activities. 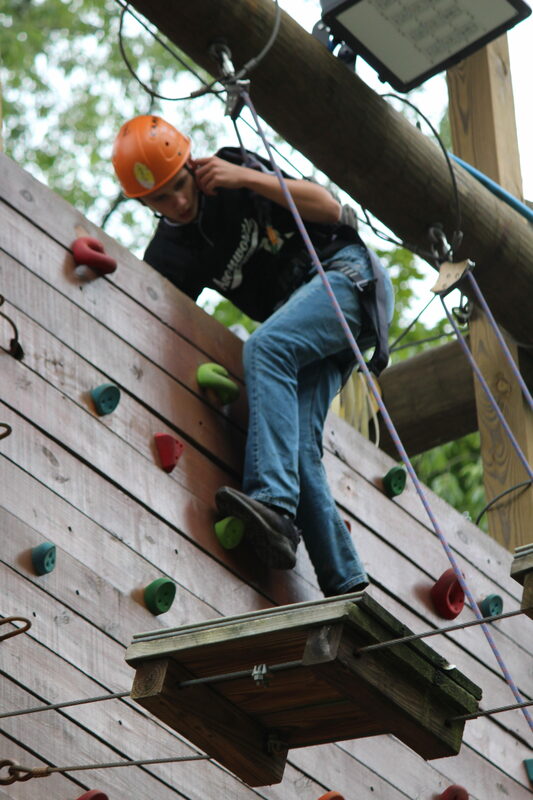 Jackson Shinsky is taking his final steps on the rock wall before getting in line for the free-fall. On the other hand, the students were able to participate in many physical and thrilling activities in the high ropes course. 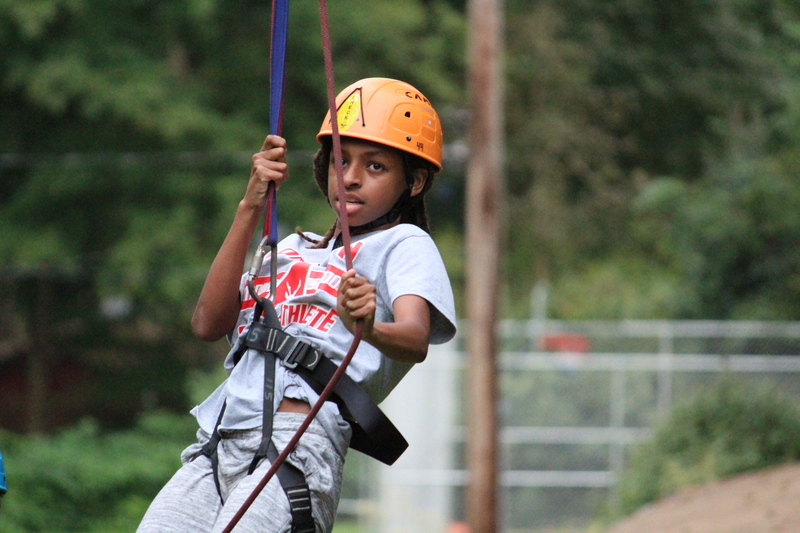 The freefall, a ten foot drop of the ledge of the tall tower, and ziplining had the freshmen’s hearts racing. If they were looking for more of a challenge, there was an opportunity to walk across a log high above the ground or climb up tall ladders to trek across a pieced apart bridge. Macey Schriefer grabs on to the safety rope at the end of the zip line. Despite the fact that most students enjoyed the trip to Guyasuta, there were a few complaints. Nathan Vietmeier said that, “It was a little bit fun sometimes. Some things were not fun.” He further explained that because of the long waits, he did not do anything on the high ropes course, besides the zip line and freefall. The class of 2022 added another successful field trip to the Guyasuta books.